One of the most famous goals in football history is Diego Maradona’s “Hand of God goal” in the 1986 World Cup Quarterfinal between Argentina and England in which the legendary forward intentionally struck the ball with his hand into the goal. The illegitimate goal was given to the Argentines, who went on to win the match and later the tournament. More recently, in the 2010 World Cup Quarterfinal between Uruguay and Ghana, Luis Suarez handled the ball to prevent a last-minute match-winning goal for Ghana. Suarez was rightly sent off for the offence, but Ghana missed the resulting penalty and went on to be eliminated from the tournament after a penalty shootout. There was a huge uproar after the incident with a split opinion on whether Suarez’s actions were within the realms of sportsmanship or not. The incidents mentioned above were two high profile cases of players handling the ball at the sport’s pinnacle event. But almost every football match – both in international tournaments and domestic leagues – involve at least one instance when the referee is required to make a decision on whether to penalize a player for a possible handball. Very often, it’s a tricky call to determine whether the player’s hand hit the ball or the ball hit his hand. It is an unenviable position for the referee as irrespective of the decision given by him/her, one team will always have complaints against it. The rulebook states that a player should be penalized (mostly by a free-kick or penalty or a maximum of a yellow card) in the scenario where he/ she deliberately handles the ball to ensure that the play is favourable for his/her team – either to retain possession/ keep advantage or score a goal. 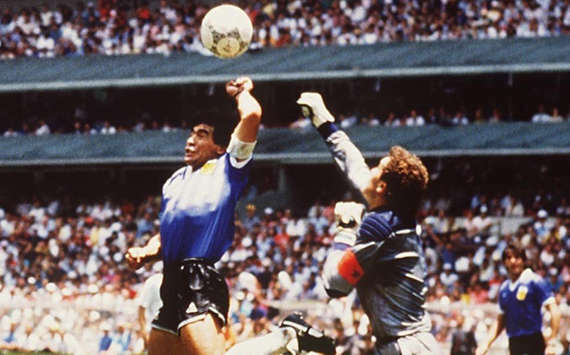 Hence, going by the rules, Maradona’s “Hand of God” act shouldn’t have been given as a goal and instead he should have been cautioned for attempting to use illegitimate means to score a goal. However, if a player intentionally handles the ball in an attempt to prevent an obvious goalscoring opportunity, then the player has to be given an instant red card – as in the case of Suarez against Ghana. The harsher penalty isn’t for deliberate handling, but for an unfair intervention which prevented a goal from being scored. But football’s rules don’t consider the contact of the ball with a player’s arm or hand as illegal. Many misinterpret the rule as any contact of the ball with the arm or hand is an offence. The keyword here is deliberate. Both Maradona and Suarez had handled the ball with full knowledge of what they were doing and hence the two should have been penalized (one famously wasn’t while the other rightly was). During the match between Manchester United and Chelsea last season, Cleverley’s shot on goal hit Lampard’s hand, who was inside the penalty area and very close to the United midfielder. The referee ruled it as unintentional and unavoidable, and so didn’t penalise him for it. Although Manchester United felt they were denied a legitimate penalty, the ruling from Atkinson was thought to be correct. Similarly, United States’ star player Landon Donovan found out otherwise in the 2013 CONCACAF Gold Cup final between USA and Panama when his appeal was a handball was rejected. Donovan’s cross hit the hand of a Panama defender who seemed to be taking evasive action in an attempt to avoid the ball touching his hands. The referee considered the contact to be unintentional and didn’t penalize the defender. The referees have to take into account the proximity of the potential offender to the player who had the last contact with the ball and also the speed with which the ball was travelling, to determine whether the player had adequate time to avoid the ball’s contact with his hand. Another factor to be considered is whether the player’s hands were in their natural position or not, as many defending players spread their arms in an attempt to increase the chances of blocking the ball. If the referee feels that the positioning of the player’s arms was not natural, then the player should be penalized. Also, the referees need to be wary of players trying to manipulate the rules to get their way – attacking players may attempt to try to hit the hands of the defenders to get a free kick or penalty while an offending player may try to pretend that a deliberate handball was accidental. 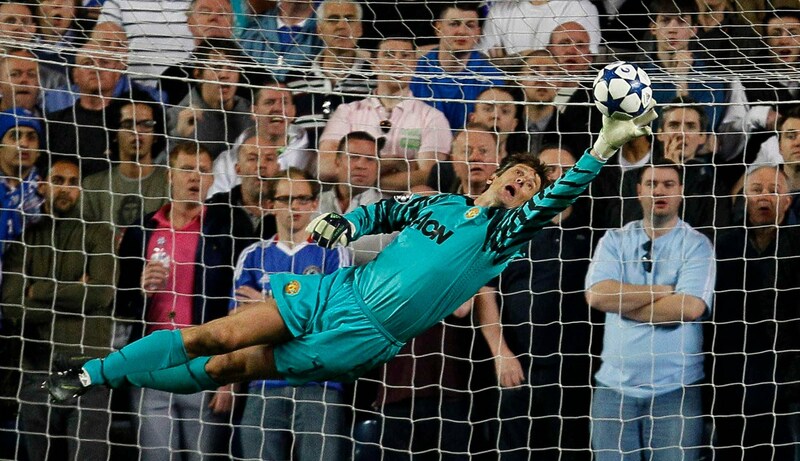 Goalkeepers have the freedom to handle the ball inside their own penalty area. Outside the penalty box, the rules on handling the ball are applicable to the keepers just like any outfield player. To summarize, there are some blatant cases of a player handling the ball deliberately, which have to be penalized without any doubt. But in most cases, referees must use their judgement to analyse if the contact was intentional or not. A simplistic way to decide would be - did the hand hit the ball or did the ball hit the hand? This along with factors like the positioning of the defending player’s hands, the proximity to the ball when it was struck and the speed with which the ball was travelling that help the referee in taking a call. The 50-50 scenarios, which can go either way, are a no-win situation for the referees as they are certain to get the wrath of the team for whom the decision was unfavourable. In these cases, the referees put their experience to use and also consult the linesmen before taking the decision which they deem correct. 5 times Football proved that it can change the world!